VietNamNet Bridge - Though it is the world’s top cashew exporter, Vietnam imports 1 million tons of cashew nuts out of 1.4 million tons of raw materials every year for processing. The country has been relying heavily on the world’s material market. If the material prices fluctuate, Vietnamese enterprises may fail to fulfill export contracts or deliver products on schedule, and their products may not meet requirements on food hygiene. In 2016, Vietnam exported 347,000 tons of cashew nuts worth $2.84 billion, increasing by 5.6 percent in quantity and 18.4 percent in value compared with 2015. In that year, the world’s total cashew nut output was 3 million tons, while Vietnam imported 1.1 million tons. In the first eight months of 2017, Vietnam exported 223,000 tons worth $2.2 billion, which represented the 1.1 percent decrease in volume, but the 24.9 percent increase in value compared with the same period of 2016. The average export price was $9,842.5 per ton in the first seven months, or 27.2 percent higher. 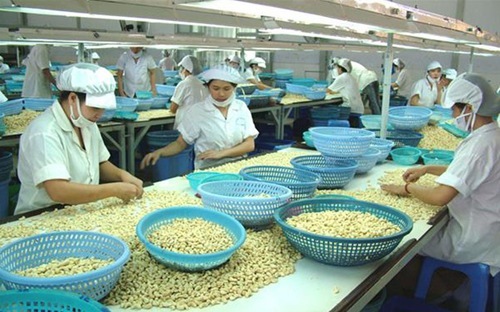 According to Vinacas, Vietnam plans to obtain $3 billion from cashew nut exports in 2017, or $160 million higher than 2016. Meanwhile, due to the bad weather, the output is modest, just 300,000 tons and the amount of cashew nuts for processing is 250,000 tons only. As such, to fulfill the export plan, Vietnam would have to import 200,000 tons more in 2017 than the last year. According to Nguyen Duc Thanh, chair of Vinacas, most markets which import processed cashew products from Vietnam set high requirements on quality and food hygiene. This means that Vietnamese processors need to be sure that the input materials have high quality. Therefore, Vinacas believes that Vietnam needs to expand the cashew growing area. Do Ha Nam, chair of Intimex Group, said Vietnam is No 1 in the world in cashew nut processing technology and it has the best products in the world. Therefore, Vietnam needs to boost exports to earn more money. He thinks now is the right time for farmers to expand the cashew growing area again as raw cashew nuts now can go for good prices. In 1996, Vietnam began importing raw cashew nuts from Africa. In 2016, Vietnam surpassed India to become the biggest cashew nut exporter. Vietnam’s products are consumed in more than 100 markets. By the end of 2016, Vietnam had 300,000 hectares of cashew growing area, mostly in Binh Phuoc, Dong Nai and Ba Ria – Vung Tau. The raw material price increased from 10,000-12,000 per kilo some years ago to VND40,000 per kilo.